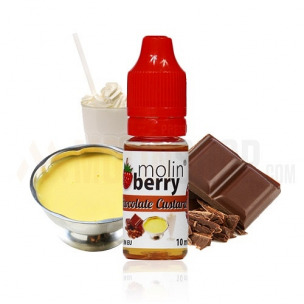 Chocolate Custard 10ml. So there it is: an ultimate taste combination. A Holy Grail of flavor. A true delight for dessert lovers. Chocolate Custard 10ml. So there it is: an ultimate taste combination. A Holy Grail of flavor. A true delight for dessert lovers. Yes you read it well – there is chocolate and custard so probably two most awesome & delicious things on Planet Earth. But we went totally crazy on this one and we decided to add just a pinch of our another best-selling flavor to it. I won’t spoil the pleasure of discovery so I won’t tell you what it is but I can assure you – you will be blown away. :) Dosage - 6-8%. Bottle 10ml made from PET material, childproof cap, long, thin dropper. Produced in EU.